A few weeks ago I was having lunch with my Mother-in-Law at our local town lunch place. One of her friends joined us and was telling me about some “quilted fabric” she found while cleaning her mother’s place out. She asked if I would like to have it. I have to be honest; I was not too enthused, but, I said I might be able to use it for something. A few days later Bob arrived home from dropping off groceries for Isabel with a shopping bag full of some real quilting treasures. I found fabric pieced together in the 30s waiting to be quilted! Inside I found a 70″ x 70″ quilt top. It is a very scrappy Bow Tie block quilt. I added borders and quilted it, but still need to add the binding. 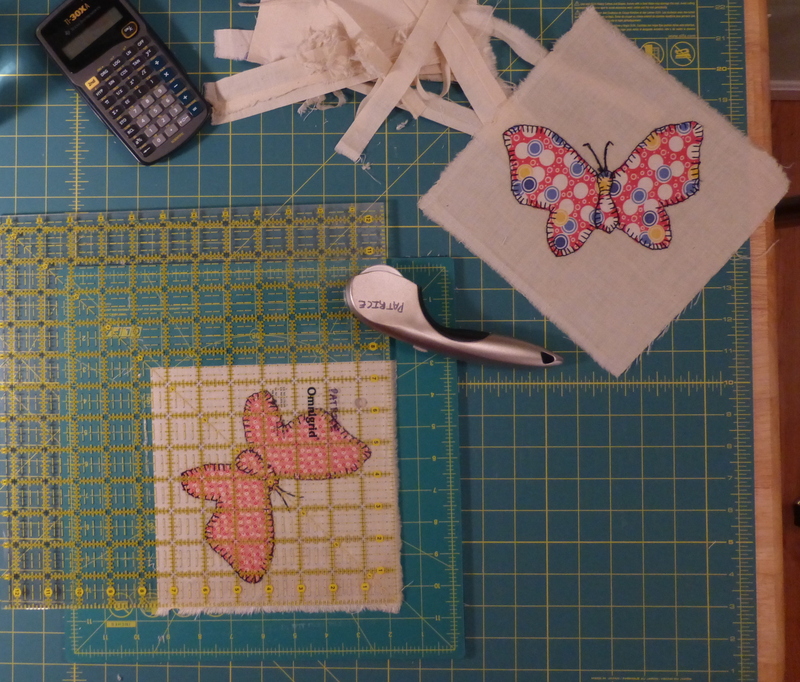 The next thing I found in the bag was a set of 24 butterfly applique blocks that had been pieced together. I was going to just add some borders and quit it up, but Colette at Quilters Common insisted that I needed to take the top apart and use the blocks to create a full size quilt. 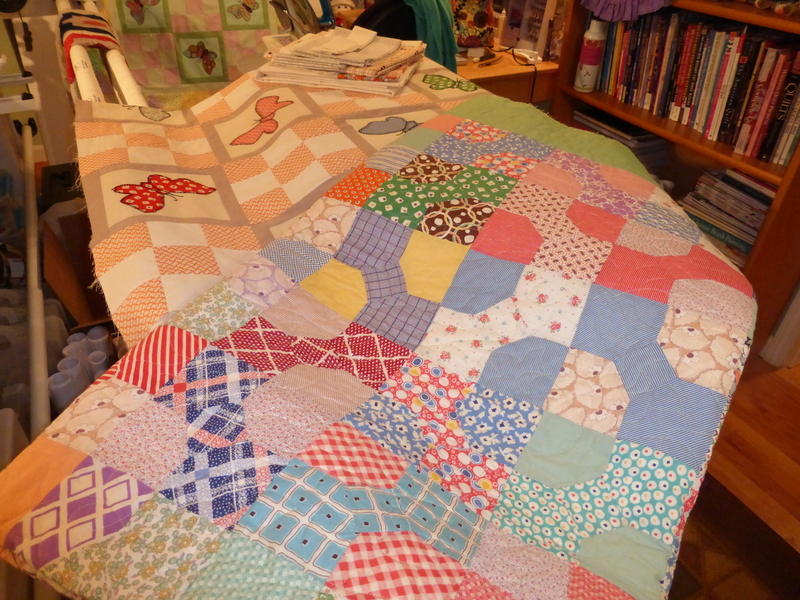 She was certain whoever made the blocks intended to make a much larger quilt. With this thought in mind I decided to take the top apart and trim the blocks so they were all 7 1/2″ squares and use them with nine patch blocks in an Irish Chain setting. I am glad I listened to Colette, because I am falling in love with this quilt top. I still need to add the borders and quilt it, but, I have a plan for the quilting. Since I was designing a top with the butterfly blocks I decided write a pattern for the quilt. I needed to include instructions for the Butterfly Applique Blocks, so I thought it only fair that I make a few of them myself. I ended up with a nice little wall hanging sized quilt made with Kaffe Fassett fabrics. I have to thank Alice for coming to my rescue and picking out the the perfect shade of dot fabric for me. I was having a difficult time finding just the right fabrics for my nine patch blocks. Once I get these quilts finished I will finalize the pattern and you will find it for sale on Craftsy. The pattern will include instructions for both sizes of the quilt. But, there is one more treasure to show you. 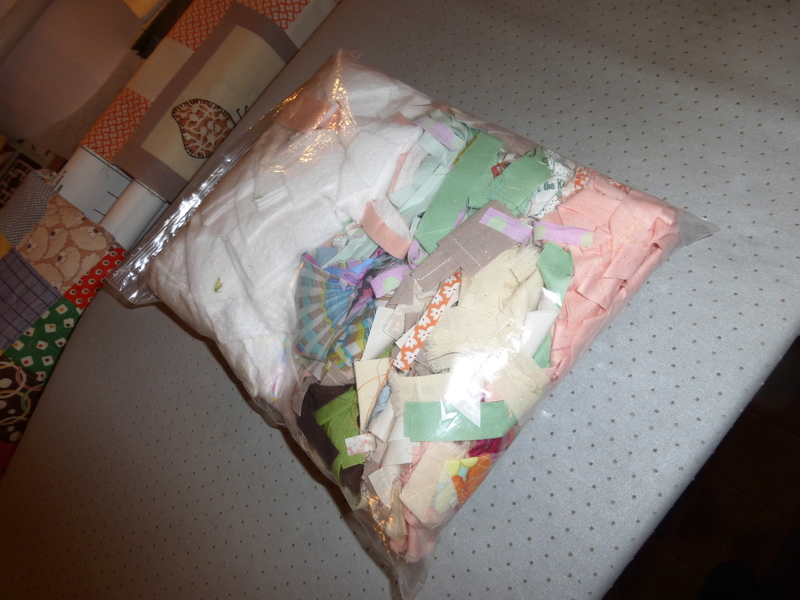 Two Sunbonnet Sue blocks were also in the bag of treasures. 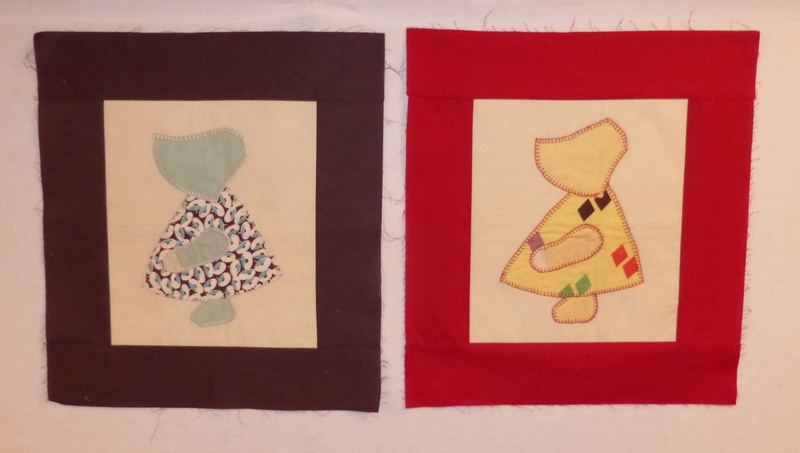 I have added borders to them and will be making pillows with them …. AND I am using scraps from my projects to stuff the pillows. Save yours up and do the same thing with them! 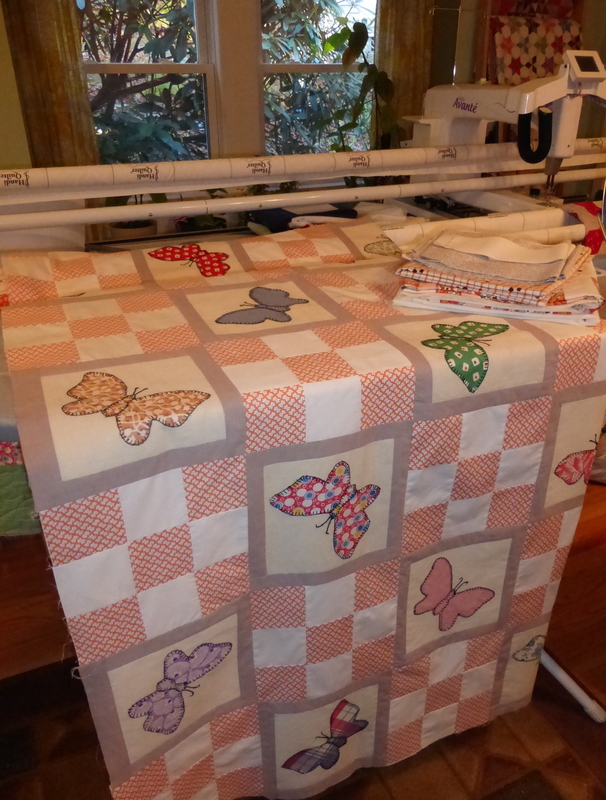 When looking at all of these quilting treasures I see fabrics in the Butterflies and Sun Bonnet Blocks that are also in the Bow Tie Quilt top. Isn’t it interesting to have a set of projects that have more than likely been worked on by one person! 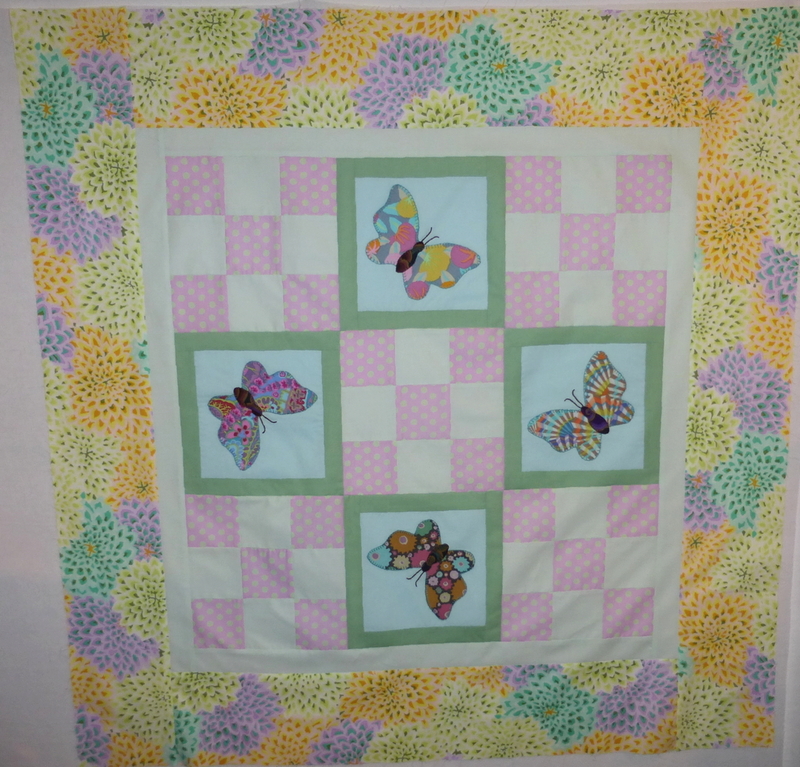 This entry was posted in Applique, Quilts and tagged 1930s quilt, butterfly quilt, kaffe fassett, sun bonnet sue, vintage quilt on November 8, 2014 by pmegio.